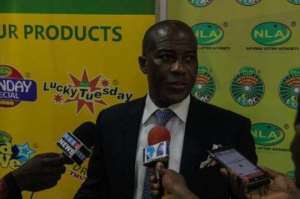 The leadership of Licence Lotto Operators and Agents Association (LLOAA) has commended the Director-General of National Lottery Authority, Mr. Kofi Osei-Ameyaw and the Board of NLA for bringing the Private Lotto Operators and Agents popularly known as Banker to Banker on board for licensing under the PPP arrangement. In a statement issued on Tuesday, February 28, 2018 and signed by its Leader and Executive Chairman, Mr. David Offei Agyekum said they very grateful for this innovative Public-Private Partnership concept from the National Lottery Authority. "This will enable us to also contribute meaningfully to the socio-economic development of the Nation", he excited. "We are okay with the licence fees and we hope that the NLA will totally implement and enforce the rules and regulations concerning the licensing of the Banker to Banker Lottery in Ghana", he emphasized. "I, Mr. David Offei Agyekum *(CEO of Super 4 Intelic Ltd)* on behalf of all Private Lotto Operators and Agents in Ghana would like to officially thank the Board of NLA and Kofi Osei-Ameyaw for this wonderful public-private partnership initiative", he concluded.